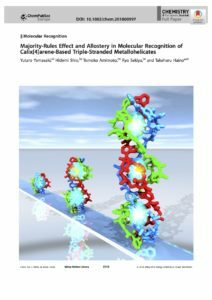 論文：”Majority-Rules Effect and Allostery in Molecular Recognition of Calixarene-Based Triple-Stranded Metallohelicates”,Yutaro Yamasaki, Hidemi Shio, Tomoko Amimoto, Ryo Sekiya, and Takeharu Haino, Chem. Eur. J., 2018, 24, 8558-8568.